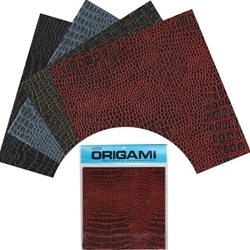 Lizard Skin Embossed Origami Paper 7"
Specialty Origami Paper → Lizard Skin Embossed Origami Paper 7"
The Lizard Skin Textured Origami Paper includes 20 sheets in 4 different color combinations. This 7" embossed paper is imported from japan. This "Lizard Skin" Origami Paper brings life like look and texture to your origami animals. The paper is a kraft paper base embossed with a texture. This origami paper pack contains 20 sheets of paper in 4 different color combinations: black, grey, red/black, and green/black. You will be amazed at the difference this paper makes in your origami folding. For other animal prints, try our Animal Print Origami Paper Pack.